More than three decades into a career that shows no signs of slowing down or letting up, AC/DC, like electricity itself, provides the world with an essential source of power and energy. Since forming in 1973, AC/DC's high voltage rock 'n' roll has flowed out into the world via consistently sold-out concert tours and global sales totaling more than 150 million albums and counting. Sony BMG Music Entertainment's #1 best-selling catalog act worldwide, AC/DC has sold nearly 70 million albums in the U.S. alone, making AC/DC one of the five top-selling bands in American music history. One of the group's best-loved works, the enormously successful and influential "Back In Black," has achieved RIAA "Double Diamond" status, for sales in excess of 22 million copies in the United States, and is the U.S.'s fifth largest-selling album ever. Taking a cue and encouragement from their older brother's musical success, Angus and Malcolm Young formed their own rock 'n' roll combo and premiered their inimitable interlocking guitar sound on December 31, 1973 at a New Year's Eve gig at Sydney's Chequers Club. Calling their new rock band "AC/DC" (from the back of a sewing machine owned by their sister, Margaret), Angus and Malcolm moved from Sydney to Melbourne and began plowing through numerous line-ups searching for a solid rhythm section and a lead singer whose voice could match the manic assault of the Young brothers' guitars. The newly-christened AC/DC found its spiritual sparkplug in Bon Scott, a hard-living, hard-loving, hard-playing wild-eyed rabble-rousing singer who'd once "auditioned" for the band when he'd worked for them as a roadie and driver back in Sydney. With Bon Scott, another born Scotsman who'd relocated to Australia as a lad, in place as co-frontman to Angus's trademark raffish schoolboy-in-knickers, AC/DC was ready to electrify the world. Quickly signed by George Young to the Albert Records label in Australia, AC/DC kicked out its first Australian album releases, 1974's "High Voltage" (a somewhat different album from the US "High Voltage") and 1975's "T.N.T." With each album achieving silver, gold, and platinum status in Australia, AC/DC embarked on a regime of relentless touring that would become one of the most enduring hallmarks of the band's career. In 1976, having conquered their very first continent, AC/DC set off for Great Britain. When the band's no-holds-barred double-barrel rock 'n' roll landed them a residency at the prestigious Marquee Club, AC/DC promptly broke the venue's all-time house attendance record. AC/DC's days in clubland would not last much longer. Within a year, "Let There Be Rock," the band's first simultaneous world release and first to use the unmistakable AC/DC logo -- raised metallic Gothic lettering separated by Zeus's own lightning bolt -- would catapult them into the stadium strata. AC/DC was ready to take on America. The summer of 1977 found AC/DC performing a dizzying crisscross of American gigs, ranging from clubs like the Palladium and CBGB in New York and the Whiskey in Los Angeles to sprawling venues like the Jacksonville Coliseum. By 1978, AC/DC was one of the hottest concert attractions in the world. For the group's next studio album, they teamed up with producer Mutt Lange to create the undeniable hard rock masterpiece, 1979's "Highway To Hell," the first AC/DC album to break into the US Top 100 and the first to go gold in America. In November of that year, the band went to Paris to film the monumental "Let The Be Rock" concert film, a quintessential document of a golden moment in the band's rise to world fame. On February 19, 1980, with the band finding genuine success around the world, lead singer Bon Scott died in London at the age of 33. Reeling from the shock of the loss of their boisterous soulful lead singer, the surviving members of AC/DC decided there was only one way to pay proper tribute to Bon Scott: carry on and create the music he'd want them to make. The group found an incredibly simpatico new lead singer and frontman in Brian Johnson, a Newcastle native who'd sung in a band Bon Scott raved about called Geordie. Returning to the studio with Mutt Lange, AC/DC and the group's new vocalist created "Back In Black," one of the best-selling albums, in any musical genre, of all-time. Powered by the title track and the anthemic "You Shook Me All Night Long," "Back In Black" hit #1 in the UK and #4 in the US, where it has gone on to achieve 22x platinum (double Diamond plus) status. 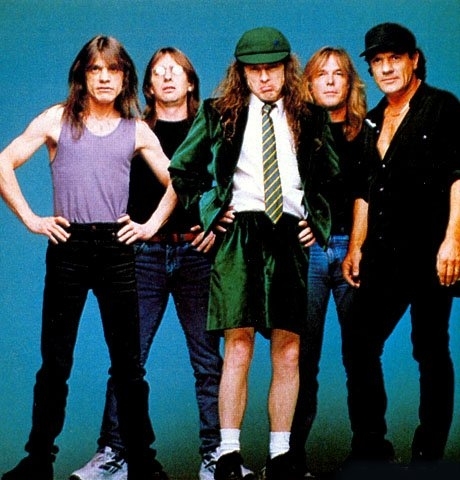 AC/DC continued releasing best-selling albums through the 1980s and 1990s accompanied by strings of sold-out tours and major headlining concert and festival performances -- including attendance-record-smashing concerts on the "Monsters of Rock," Castle Donington, "Rock In Rio," and 1991's "Rock Around The Bloc" festival at Tushino Airfield in Moscow, a free concert attended by close to one million fans. On March 10, 2003, AC/DC was inducted into the Rock and Roll Hall of Fame at a ceremony at the Waldorf-Astoria in New York City. Aerosmith's Steve Tyler performed the induction, sang "You Shook Me All Night Long" with AC/DC during the ceremony and described the group's signature power chords and timelessly enduring rock 'n' roll as "...the thunder from Down Under that gives you the second-most-powerful surge that can flow through your body." but but that's their thing. Yeah but look how long they have been together. You can only make so many songe before eventually you keep getting that same beat.